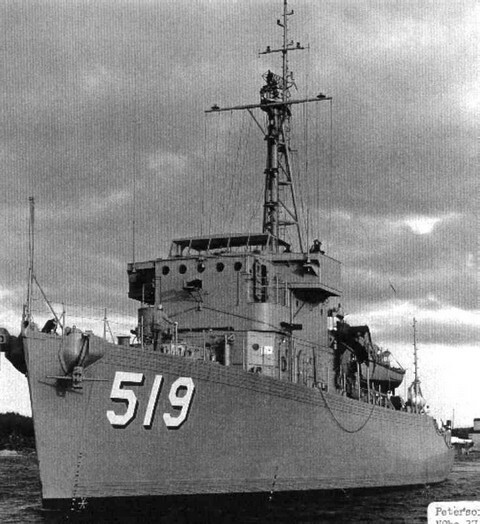 The second Ability (MSO-519) was laid down on 5 March 1956 at Sturgeon Bay Wis. by Peterson Builders Inc.; launched on 29 December 1956 sponsored by Mrs. Henry P. Williams; ferried to Boston - via the Great Lakes and the St. Lawrence River fitted out at the Boston Naval Shipyard and commissioned there on 4 August 1958 Lt. Comdr. W. L. Hough in command. Following outfitting the minesweeper put to sea on 28 August - bound for Charleston S. C. - and on the 29th reported for duty with Mine Squadron (MinRon) 4. She remained at Charleston until embarking upon her shakedown cruise on 17 September. The ship conducted that training out of Guantanamo Bay Cuba and returned to Charleston on 20 October. She served with Mine Division (MinDiv) 45 operating out of Charleston through the end of 1958 and the first six months of 1959. On 1 July 1959 she was transferred to MinDiv 85 as its flagship. Ability continued to operate out of Charleston primarily in support of the Naval Mine Warfare School. She also occasionally provided support services to the Naval Ordnance Laboratory Test Facility located at Port Everglades Fla. and to the Naval Mine Defense Laboratory at Panama City Fla. When not engaged in those duties she conducted independent ship's exercises and type training along the east coast and in the West Indies. Ability served as a close recovery vessel in May 1961 during the "Freedom 7" space shot. For the last two months of 1962 she supported the quarantine of Cuba brought about by the siting of offensive Soviet missiles on that island. She began that duty patrolling the Windward Passage but concluded it as harbor defense ship for the American base at Guantanamo Bay. The year 1963 began normally for Ability with operations out of Charleston in support of the Naval Mine Warfare School and the Naval Mine Defense Laboratory. That autumn however she added a new' dimension to her operations which would remain a facet of her service for the remainder of her career. Late in September the minesweeper stood out of Charleston bound for the Mediterranean Sea and her first tour of duty with the 6th Fleet. On 5 October she reported for duty with the Commander 6th Fleet at Rota Spain. Ability spent the next four months conducting minesweeping exercises supporting amphibious landing exercises and visiting various Mediterranean ports. On 12 February 1964 she completed turnover ceremonies at Rota shaped a course for Charleston and arrived back in her home port on 1 March 1964. For the remainder of 1964 and all of 1965 she conducted operations out of Charleston in support of the Naval Mine Defense Laboratory and made voyages along the east coast and to the West Indies to participate in various exercises and to engage in refresher training. Her highlight of 1965 came in December when she provided support services for the "Gemini 6" and "Gemini 7" space shots. Early in 1966 Ability embarked upon another assignment with the 6th Fleet. In February soon after her arrival in the Mediterranean she participated in the search for an American nuclear device lost when two Air Force planes a B-52 bomber and a KC-135 cargo plane collided in midair. Otherwise the deployment consisted of the usual exercises and port visits. Ability resumed to Charleston on 13 July 1966 and resumed services to the Mine Defense Laboratory and the Mine Warfare School. That employment lasted until 11 May 1967 when she shaped a course for Montreal Canada to make a goodwill visit to the world's fair at that city Expo '67. After also visiting Quebec the minesweeper resumed her normal duties at Charleston on 9 June 1967. On 25 July 1968 Ability embarked upon her final Mediterranean cruise. The assignment lasted until late November and consisted of normal 6th Fleet operation - exercises port visits and Soviet ship surveillance missions. On 30 November she departed Gibraltar bound for the United States. The minesweeper re-entered Charleston harbor on 15 December and began a holiday leave and upkeep period. During 1969 and the first five months of 1970 Ability busied herself with normal east coast and West Indies operations. In June of 1970 she was placed out of commission to undergo extensive repairs and modifications at Todd Shipyards Corp. in Brooklyn N.Y. The contract for her rehabilitation however was terminated on 16 October 1970 as a result of Department of the Navy force level decisions. Determined to be excess to the needs of the Navy Ability was struck from the Navy list on 1 February 1971. She was subsequently sold for scrapping.